Post: Gaurav Akrani. Date: 7/08/2010. No Comments. Label: Management. Every manufacturing organisation is concerned with the quality of its product. While it is important that quantity requirements be satisfied and production schedules met, it is equally important that the finished product meet established specifications. Because, customer's satisfaction is derived from quality products and services. Stiff competition at national and international level and consumer's awareness require production of quality goods and services for survival and growth of the company. Quality and productivity are more likely to bring prosperity into the country and improve quality of work life. However, the management looks to achieve customer satisfaction by running its business at the desired economic level. Both these can be attained by properly integrating quality development, quality maintenance and quality improvement of die product. The integration of these three aspects of a product can be achieved through a sound quality control system. Quality is a relative term and it is generally used with reference to die end use of the product. For example, a gear used in sugarcane juice extracting machine may not possess good surface finish, tolerance and accuracy as compared with the gear used in the head stock of a lathe, still it may be considered of good quality if it works satisfactorily in die juice extracting machine. The quality is thus defined as die fitness for use/purpose at die most economical level. The quality depends on die perception of a person in a given situation. The situation can be user-oriented, cost-oriented or supplier-oriented. Since, die item is manufactured for me use of die customer, die requirements of die customer dictates die quality of die product. Quality is to be planned, achieved, controlled and improved continuously. Fitness for purpose : The component is said to possess good quality, if it works well in the equipment for which it is meant. Quality is tiius defined as fitness for purpose. Conformance to requirements : Quality is die ability of the material/component to perform satisfactorily in an application for which it is intended by die user. Quality of a product, thus, means conformance to requirements. Customer needs have to be assessed and translated into specifications depending upon die characteristics required for specific application. Just as every human has his own characteristics every application has its own characteristics. Grade : Quality is a distinguishing feature or grade of the product in appearance, performance, life, reliability, taste, odor, maintainability etc. This is generally called as quality characteristics. Degree of preference : Quality is the degree to which a specified product is preferred over competing products of equivalent grade, based on comparative test by customers, normally called as customer's preference. Degree of excellence : Quality is a measure of degree of general excellence of the product. Measure of fulfillment of promises : The quality of a product is a measure of fulfillment of the promises made to the customers. Suitability : For specific application. Reliability : It should give efficient and consistent performance. Durability : It should have desired life. Safety : Safe and foolproof workability. Affordability : It should be economical. Maintainability : It should be easy to maintain. Aesthetic look : It should look attractive. Satisfaction to customers : It should satisfy the customers' requirements. Economical : It should have reasonable price. Versatility : It should serve number of purposes. A product can be said to possess good quality if all the above requirements are properly balanced while designing and manufacturing it. Control can be defined as "a process by means of which we observe the actual performance and compare it with some standard". If there is a deviation between the observed performance and the standard performance then it is necessary to take corrective action. Quality control is the process through which we measure the actual quality performance, compare it with the standards and take corrective action if there is a deviation. It is a systematic control of various factors that affect the quality of the product. It depends on : Material, Tools, Machines, type of labour, working conditions, measuring instruments, etc. Quality control can be defined as the entire collection of activities which ensures that the operation will produce the optimum quality products at minimum cost. It can also be defined as the tools, devices or skills through which quality activities are carried out. It is the name of the department which devotes itself full time to quality functions. The procedure for meeting the quality goals is termed as quality control. It is a system, plan or method of approach to the solution of quality problems. Total Quality control is "An effective system for integrating the quality development, quality maintenance and quality improvement efforts of the various groups in anorganization, so as to enable production and services at the most economical levels which allow full customer satisfaction." Work out details of product requirements, set the standards (specifications) on the basis of customers preference, cost and profit. Select inspection plan and set up procedure for checking. Detect deviations from set standards or specifications. Take corrective action through proper authority and make necessary changes to achieve standards. Decide on salvage method i.e. to decide how the defective parts are disposed of, entire scrap or rework. Developing quality consciousness in the organization. Quality control is not a function of any single department or a person. It is the primary responsibility of any supervisor to turn out work of acceptable quality. 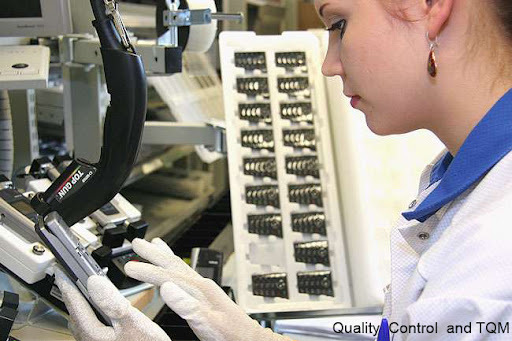 Quality control is one aspect of production planning and control. It is basically concerned with the quality production through regular inspection technique. Quality is a combination of characteristics pertaining to the manufacture of the product and control is the correction in the quality of the product, when the deviations in the product are more than expected. A good quality item is one which conforms to some standard specifications. These specifications are determined by the expectations of consumers and also by the availability and costs of processes and materials. To most people, quality is variable. It is subjectively judged because it deals with the relative goodness of a product. When a buyer boasts that his house or car is the best, it implies high quality. Quality is thus subjective and vaguely measurable. "subjective quality refers to degree of goodness of a product and objectively it consists of a set of measurable characteristics for which standard dimensions together with small, allowable departures, up and down, may be prescribed." All manufacturing processes face a basic difficulty. It is physically impossible to make all items or units exactly alike. There is always variability in the product. With precision manufacturing, the variability may be difficult to see but nevertheless it is there. When variability becomes obvious it results in scraps, re-work and losses, thus adding to the costs. Establishment of quality standard : The main objective of quality control is the economical production of a high quality product at the quality level the customer wants. It is basically for eliminating variations in production and in order to have uniformity in production. Locating quality deviations : It is necessary to analyze the trend and extent of quality deviations in a manufacturing process. Such deviations should be explained by statistical techniques when they cannot be attributed to the element of chance. Evaluating methods and processes of production : By evaluating methods and processes of production, quality control helps to take corrective measures to maintain the quality of the product during the process of manufacture. Quick sale of quality goods : Quality control accelerates the sale of the goods by supplying only the quality goods in the market. Consumers also support quality goods. Production of standard quality goods : Quality control aims at manufacturing standard quality products and avoids the production of inferior quality goods. Such standard quality goods give satisfaction to consumers and also create goodwill in the market. Improvement in quality : One objective of quality control is to find out high quality standards and to make constant efforts to reach those standards. Quality control aims at creating quality consciousness at all levels in the Organisation. Devising control over raw materials : The quality of the finished product is determined mostly by the quality of raw materials. It calls for close connection between the raw material purchase department of the company and the vendors. As and when necessary, a resident inspector may be deputed by the Quality Control Department in the vendor's place to see that only goods in accordance with specifications are supplied. It is advisable to reinspect the raw materials before putting them to actual use. Fixing standards and specifications : In order to make any scheme of quality control successful, it is essential to predetermine standards and specifications. The practice should be to provide quality instructions in the form of drawings, showing shapes, dimensions and specifications describing color, strength, thickness, chemical composition, etc. Exercising control over production operations : In order to execute efficient practices, the technical expert of the Quality Control Department must investigate, from time to time, the operating methods. Such investigation helps to eliminate all possible variables. Locating inspection points : When the points at which defects occur are wrongly located or located with delay, it hinders quality control. Therefore there should first inspection of the raw materials at the vendor's places, then at the company's plant, then at the various points during the process of production and finally at the time of packing. The defects are likely to occur at these points. The finished goods can be cleared after obtaining 'O.K.' or 'All Correct' from the Quality Control Department. Maintaining quality of equipments : The final quality of the products is conditioned by the quality of the equipments and other devices used. The Quality Control Department is responsible for testing the equipment used in inspection such as gauges, which measure dimensions, electronic devices, magnetic devices and industrial radio graphical instruments. Maintaining records : The Quality Control Department is responsible for maintaining all records relating to quality inspection and control and the number rejected. Quality control is important as it offers certain advantages to the manufacturer. Such advantages are: stability to sale, goodwill in the market, ability to face market competition effectively, reduction in production costs, and elimination of wastage due to rejections and uniformity in production. These benefits are important for sales promotion and profit maximization. Manufacturers now give special attention to quality control techniques for long term benefits. Attention is given to research and development activities for this purpose. Even foreign collaborations are made for raising the quality standards of products manufactured. In brief, quality control is a matter of great importance in production management. The benefits of quality control to consumes are: Availability of standard quality and reliable goods, proper reward for the price paid, safety to life and health, better standard of living and protection against substitution or adulteration and quick shopping of goods. Consumers always purchase standard quality goods even by paying a little higher price as they get full satisfaction over a long period from quality goods. Consumers, particularly educated consumers, support quality products as they know the benefits available from such standard quality products. This suggests the importance of quality control from the point of view of consumers. The importance of quality control is, now, accepted even at the global level. Consumers now insist for superior quality goods. Expenditure on quality control is an investment for more sale and satisfaction to consumers. Quality control is a must for export promotion. Companies can capture foreign markets only by manufacturing superior quality goods at reasonable cost of production. Japan is a leading world exporter. This is mainly due to superior quality of goods manufactured in Japan. Governments in many countries support quality control measures. They provide all possible help for maintaining superior quality of goods. Restrictions are also imposed on the manufacturing of cheap goods. Even associations of manufacturers and traders support quality control measures. This suggests the importance of quality control in business. Improvement in the quality of production and reduction in the production cost. Uniformity in the production and supply of standard quality goods to consumers. Offering full return of the price paid by consumers and giving convenience and satisfaction to consumers. This also develops cordial relations with consumers. Reduction in spoiled production and rejection from consumers and dealers. Promotion of exports due to superior and standard quality production. Sales promotion in the internal market and facing market completion with confidence. Reduction in the inspection cost. Improvement in the productivity and motivation of employees. Making the products popular in the market and thereby to develop market goodwill. Market research cost of discovering quality needs of customer. Product research and development cost of creating a product concept, which will meet quality needs. The design cost of transmitting product concept into information which represents planning for manufacturer. Cost of inspection and test. Cost of scrap and quality failure. Cost of Quality planning : It includes the cost associated with creating a overall quality plan, the cost of market research and product development, inspection plan, reliability plan etc. Cost of Documenting : It includes cost of preparation of manuals and procedures to communicate these costs. Process control cost : Used with quality plans procedure to achieve fitness for use. Cost of training : Cost associated in preparing any programs for attaining, improving, maintaining quality programs. Cost associated with preventing recurring defects : Engineering, technical, supervisory, cost of preventing recurring defects. Cost of investigation, analysis of correction of causes of defects by quality central department. Cost of investigation, analysis of correction of causes of defects by engineering control department. Costs associated with measuring, evaluating or auditing the products, component and purchase materials to assure conformance with quality standard and performance requirement are called as "Cost of appraisal". In other words, the cost of evaluating, quality and of identifying and segregating non-conforming part and assemblies. Receiving or incoming tests and inspection. Set up for inspection and test. Review of test and inspection data. Evaluation of field stocks, spare parts. The costs associated with defective products, components, materials that fail to meet quality requirements and results in manufacturing losses are called as "Cost of internal failures". Costs associated with scrap i.e. Cost of material, labor. Cost of rework, repair i.e. Cost of making defective parts and assembly rules. Cost of re-inspection and re-test after defective parts are repaired. Costs associated with material review activity. Cost of processes yield lower that might be attainable by improved controls. Trouble shooting. Cost because of defective products being shifted to the customer. Cost of processing complaints from the customer. Cost of service to customer to receive defective items. Cost of inspecting, preparing defective items. Cost of replacing defective products. Total quality management is a comprehensive concept and not related only to the quality of goods and services. It suggests that high quality standards (e.g., ISO 9000) should be maintained in other aspects of management such as production cost, marketing, sales promotion, etc. For such quality/efficiency in all aspects of business management, consciousness/awareness needs to be developed at all levels and among employees working in all departments of the enterprise. Employees must be motivated for maintaining high quality standards. In addition, their cooperation/involvement is necessary for maintaining efficiency in all aspects of business management. In brief, quality management is not the responsibility of management alone. Participation/involvement of both parties (management and employees) is essential for achievement of quality and other benefits. The concept of TQM is closely related to the concept of quality circles which is very popular and also successful in Japan. Quality circles are work groups that meet frequently to study the ways and means to improve quality, reduce cost, eliminate wastages and solve other production problems. Here, employees are associated with quality, cost, efficiency, productivity, consumer service and satisfaction. This creates background for the concept of TQM. TQM aims at improving the total performance at the work place. It covers all functions, activities and people who are responsible for competitiveness of an Organisation. The employees are expected to participate not only in maintaining quality but also in improving their total performance so that the wastages will be avoided, production cost will go down and the enterprise can earn more profit. TQM means strategic commitment to improving quality by combining statistical quality control methods with a cultural commitment to seeking incremental improvements that increase productivity and lower costs. Total quality management reflects the culture of an Organisation. It indicates consumer oriented, quality-oriented management philosophy. It is a commitment to quality by all managers and workers. TQM is a philosophy for achieving customer satisfaction which involves all - managers, employees and users. It is management by commitment and not management by control. This technique is to be introduced through quality circles. The route to TQM is through application of simple tools followed by Organisation change and culture change. Total Quality Management is "A process designed to focus on customer expectations, preventing problems, building commitment to quality in the workforce and promoting open decision-making." Stress on quality management : In TQM, collective efforts are being made for improving quality of goods and services so as to give more satisfaction to consumers. Quality improvement is also useful for facing market competition and for creating market reputation. In brief, TQM involves steps for improving quality and productivity. There is total commitment to quality on the part of entire Organisation. TQM covers all functions, activities and people who are instrumental for raising the competitiveness. Continuous process : TQM is a continuous process/activity as there is ample scope for using new methods and techniques for improvement in the quality standards and performance. "Steal ideas constantly and shamelessly" is the rule in TQM. Implementation of innovative ideas or taking benefit of new opportunities is an integral aspect of TQM. In fact, TQM is a never ending quest for achieving new levels of performance. Stress on quality assurance system : The aim of TQM is to give maximum satisfaction to consumers by providing goods which are best in quality (zero defects). The present ISO9000 series is a set of well recognised standards for quality assurance system. The Japanese have been using quality assurance concepts and principles as a part of their TQM implementation programme even when specific name or number was not used. Thus, quality assurance system is an integral part of TQM. Linkage of quality and productivity : The TQM technique is useful for improving quality as well as productivity. In a TQM programme, the focus is on quality improvement. However, such programme also raises productivity. The methods used in TQM programmes. E.g. stress on quality improvement, zero defects production, making all employees responsible for quality maintenance and improvement) are likely to bring quality improvement as well as yield improvement. Similarly, the TQM programme creates a feeling of participation among the employees. There is also positive improvement in the morale of employees. TQM is a gradual process : Introduction of TQM is a gradual process. It is self improvement and group improvement programme through team building for raising quality and productivity. TQM is about the gradual change of people's behavior towards the tasks they perform and their attitude towards other people. A mental revolution among the employees is required for the execution of TQM. However, such change in the mental make-up of managers and employees requires long period. This suggests that TQM is a gradual process. There are, in fact, four broad phases in the introduction of TQM. Focus on customers : Customers are the source of all the revenue that flows through the corporation. Their satisfaction keeps the money flowing especially in an open market where competitors are wooing them too. The focus of TQM is on customer satisfaction on quality, cost and delivery through improved orgarnisational quality of processes. According to British Quality Association (BQA), TQM is a corporate business management philosophy which recognised that customers' needs and business goals are inseparable. Employee involvement : Employees involvement is the most important recognised feature of TQM. In fact, quality's a team work of all employees. Their participation and co-operation are required to be taken at all levels. TQM is possible only through participative management. Under TQM, employees will be motivated to participate actively in the process of quality improvement through incentives and recognition of contribution for achieving quality standards. Formation of quality improvement teams : A cornerstone of TQM is the team building that leads to commitment to improvement. Such teams include quality steering teams, corrective actions teams and so on. Such teams motivate employees and facilitate quality improvement. Management's involvement : TQM is a systems approach in managing business and improving overall performance. It needs total commitment from the top management to provide viable leadership to the whole approach. Top level management has to take number of initiatives in order to start the process of TQM. In fact, TQM cannot have a good take off without total commitment of CEO and other senior executives. Customer satisfaction : TQM is basically for the satisfaction and welfare of customers. Needs and expectations of customers are given special attention in TQM. The attention is on customers and zero defect goods will be supplied to them. As a result, there will be reduction in the complaints of consumers/customers. TQM is not for profit-making at the cost of customers but it is for giving satisfaction and welfare to them. Quality improvement : One major advantage of a TQM is quality improvement at all levels and in all activities. There is a systematic attempt to eliminate deficiencies such as production scrap or rework, customer complaints and material shortages. The cornerstone of any successful TQM system is the organised elimination of waste. The rejection rate in the production process will be low and this minimizes waste of materials and human efforts. Due to quality improvement, the sales and profits will also increase. The company will also develop goodwill and market recognition as supplier of quality goods. Absence of additional investment : One advantage of TQM is that TQM does not require any additional investment. It improves operational quality as well as reduces cost. This technique is quite convenient to developing countries which are facing financial difficulties due to various reasons. TQM gives many benefits but without additional financial burden. Raises competitiveness : TQM technique is useful for raising quality and reducing costs. This naturally raises competitiveness in the domestic as well as global markets. TQM technique is useful for exports by raising global competitiveness. 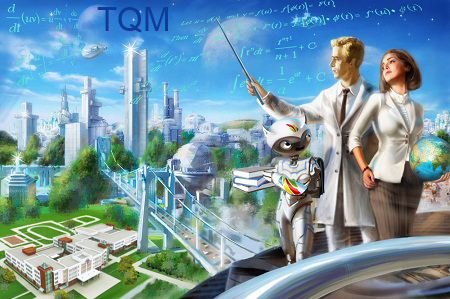 Facilitates expansion and diversification : TQM leads to large turnover and high profits along with market reputation and consumer support. The company can use this profit for the execution of its expansion and diversification programmes. In brief, TQM facilitates expansion and diversification of business. Provides trained and motivated employees : TQM philosophy has its positive impact on employees. They are given proper training, monetary and non-monetary incentives, attractive working conditions and proper treatment. Workers take pride in manufacturing defect-free products. Dewar, President of the International Association of QCs, defines QCs as "a way of capturing the creative and innovative power that lies within the work force". A quality circle is a small group of volunteers (usually 3 to 12 employees) doing similar work. They meet regularly under the leadership of their immediate supervisor, or some one chosen among the circle to identify problems, set priorities, discover causes and propose solutions. These may concern quality, productivity, safety, job structure, process flow, control mechanism, aesthetics of the work area etc. "Quality Circles are small groups of people doing similar work who, together with their supervisors volunteer to meet for an hour a week to study and solve work related problems which affect them. Circle leaders and members are trained in simple problem solving techniques which identify causes and develop solutions. At an appropriate time, presentations are made by the quality circles to the management who decide whether to accept, modify or decline the proposals". Quality Circle is a participative management system in which workers make suggestions and improvements for the betterment of organisation. QC is a form of participative management. QC is a human resource development technique. QC is a problem solving technique. To improve the quality and productivity and thus contribute to the improvements and development of the enterprise. To reduce the cost of products or services by waste reduction, safety, effective utilisation of resources, avoiding unnecessary errors and defects. To identify and solve work related problems that interfere with production. To tap the creative intelligence of the persons working in the organisation and to make full use of its human resources. To permit employees to develop and use greater amount of knowledge and skill and motivate them to apply to a wide range of challenging tasks. To improve communication within the organisation. To increase employees' loyalty and commitment to the organisation and its goals. To respect humanity and build a happy bright work place environment which is meaningful to work in. To enrich human capability, confidence, moral, attitude and relationship. To satisfy the human needs of recognition, achievement and self-development. Promote high level of productivity and quality-mindedness. Self and mutual development of employees. Creating team spirit and unity of action. Increased motivation, job satisfaction and pride in their work. Reduced absenteeism and labour turnover. Developing sense of belongingness towards a particular organization. Increased utilization of human resource potential. Enhancement in consciousness and moral of employees through recognition of their activities.